The expert doctors at Ehormones MD Lafayette offer comprehensive treatments geared towards helping you achieve an optimal state of health. There is no way around it. Everyone’s natural hormone production declines with age. The result of this decline in the production of testosterone — which is an essential male hormone — can have a significant impact on men, both physically and mentally. An easy way to visualize the importance of hormones is to think about them as couriers that travel through your bloodstream, delivering important messages to your glands and cells about your body’s growth and energy. When your hormone production is at the proper levels, your body is able to perform at its best. As you age, it is natural for these hormone levels to begin to decline. If you suffer from any of the symptoms listed above, you might be a candidate for Testosterone Replacement Therapy and/or HGH Therapy at Ehormones MD Lafayette. There is no need to have a lower quality of life simply because you suffer from low testosterone. There is nothing invasive about HRT or testosterone replacement therapy. In fact, many men just like you have sought treatment in the Lafayette area and found that Ehormones MD has had a tremendous impact on their lives. What Can I Expect from the Testosterone and HGH Therapy Process? After your initial consultation and review of your lab work with one of our expertly trained MDs, we will determine which program is right for you. Whether HGH therapy or testosterone therapy, or both, your hormone replacement therapy plan will be customized to meet the specific needs of your body. Many doctors attempt to treat low testosterone and low hgh, but most lack the training and knowledge to understand the intricacies of prescribing these therapies. One such example we hear daily is the general practitioner / family physician who treats his/her patient with testosterone injections but fails to provide the ancillary medications necessary to take while taking testosterone. We see numerous patients who have lost their libido, the ability to gain erection, whose testes have atrophied (shrunk), who have experienced gynecomastia (excess male breast tissue), all due to incorrect treatment. So, don’t mess around with your body. Allow your specialist Ehormones MD doctor to customize a plan that meets the needs of your individual body. 4. Ancillary medications, such as Anastrozole, which suppresses estrogen conversion while on Testosterone therapy, as well as HCG (Human Chorionic Gonadotropin) to prevent your testicular atrophy, are typically prescribed along with testosterone. After your initial consultation, your Ehormones MD physician will determine which Male HRT therapy is right for you. Whether HGH therapy or testosterone therapy, your hormone replacement therapy plan will be customized to meet the specific needs of your body. It’s common to find testosterone or HGH therapy in many forms due to the uniqueness of each of our bodies, so let your Ehormones MD physician customize a plan that meets the needs of your body. Is HGH Therapy or Testosterone Replacement Therapy the Same as Taking Steroids? You might find yourself wondering if hormone replacement therapy is the same as taking steroids. While anabolic steroids that are often used by professional athletes often contain testosterone or testosterone-mimicking chemicals, receiving HRT is not the same thing. Testosterone replacement therapy is all about replacing lost testosterone your body no longer produces, while bodybuilders who take anabolic steroids are often searching for unnaturally high testosterone levels – which in turn gives them an athletic edge over those with natural levels. Athletes that are caught ‘doping’ usually use this substance in combination with other chemicals that boost the person’s muscle-building ability. So the answer to your question is and emphatic NO. 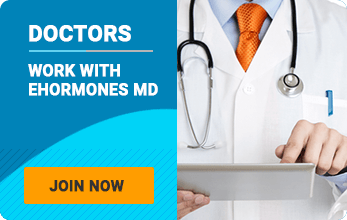 What Can I Expect with Ehormones MD HGH Therapy and Testosterone Therapy Treatment? Ehormones MD is a leader in hormone replacement therapy in Lafayette , Louisiana, with locations throughout the country. Our Testosterone and HGH doctors understand that each patient’s hormonal inner workings are unique. Therefore, all patients are carefully evaluated before any course of treatment is recommended. After scheduling your initial consultation at our Lafayette location, your doctor will review your symptoms, family history, medical history, and the results of a series of diagnostic tests performed. Some of these include a human growth hormone stimulation test, adrenal tests, and baseline blood tests. These initial tests are essential in determining how your HRT physician will outline your customized testosterone and HGH therapy plan. Once you hit 30, your body’s ability to produce important hormones like testosterone in males and progesterone in females diminishes. The result of that decline is similar for both males and females. Your quality of life begins to go down as well. However, there is no excuse for suffering that fate. Our experienced hormones replacement therapy physicians can help you get back to your normal self with sermorelin, and testosterone replacement therapy. Find our which HRT treatment is right for you and your body. For a 100% Free Consultation, call Ehormones MD Lafayette today at (337) 214-2117.